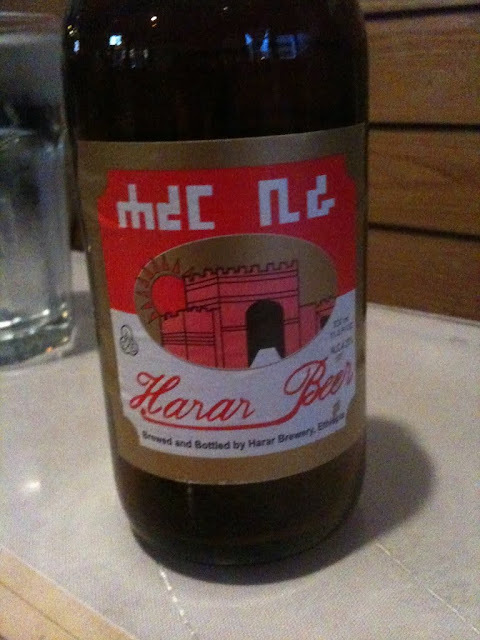 While in Washington D.C. we dined at Lalibela’s Ethiopian Restaurant. We decided to try this restaurant due to the high ratings on Urban Spoon, 70 reviews, of which 80% were positive. When we arrived at 6PM, the small bar area was crowded though all 10 tables in the dining area were empty. Most of patrons were drinking imported beers with labels I was unfamiliar with. I nearly walked out when I spied the empty dining room. It turned out we were glad we stayed for dinner. When we left at 7PM, most of the tables were packed with an eclectic mix of people. Do not let the dim lights and sparse decor scare you away from this gem. Pleasant servers confirmed our choices to be sure to get our order correct. I noticed at other tables the meals were combined and served family style on a single community platter. Our waiter asked if both our dinners could be served on the same tray. I declined, asking for my vegetarian meal to be served separately. They were happy to accommodate my request. Our table had no silverware and we were not offered any utensils. We followed the custom of eating only with our right hand. Eating with the left hand is considered impolite and unclean as this hand is used for personal hygiene duties. We started out with a couple of spinach sambusa appetizers. These golden, deep-fried dough packages were stuffed with seasoned spinach. They are similar to Greek spanakopita pockets. We learned later that wot is a spicy stew. I ordered the Yeson wat, a vegetarian combo with six different items. Kik alicha: yellow split peas with onions, garlic and tumeric. My husband had the keyena Alicha combo, including half Key wot and Alicha wot dinners. These beef and vegetable dinners were generously seasoned. Both of our dinners came with a side of colorful tomato salad. The dishes were flavorful though not overly spicy. The tastes were new to me. Two platters of food arrived served on Injera bread with a second serving of bread on a separate plate. The bread is shaped like a large crepe and has a spongy texture perfect for soaking up gravy. Each serving was mounded in rounded heaps in a decorative display on the bread. Instead of silverware, we pulled off chunks of the bread and used this to scoop up our meal. 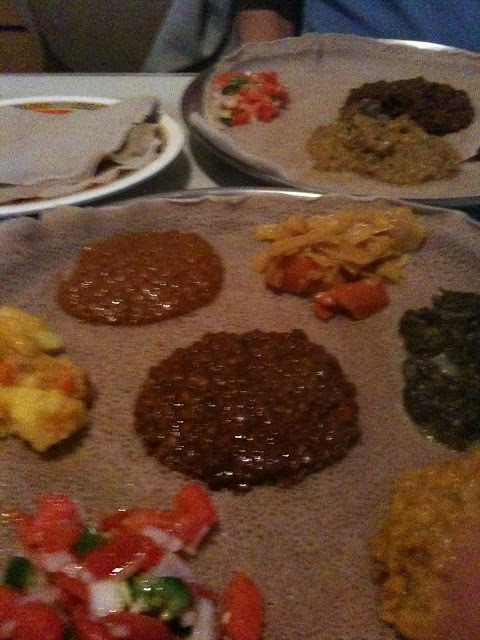 Lalibela’s Ethiopian restaurant serves a variety of foods to satisfy a wide audience. We found the service friendly and helpful. Both of us enjoyed our meals and recommend this restaurant. It is spring and the National Cherry Blossom Festival in Washington D.C. is in full bloom. The cherry trees in our country’s capital city are planted around the Tidal Basin where the Potomac River meets the shore of the city. The white and pink blossoms are in peak about the first of April depending on the weather. Our capital’s Cherry Blossom Festival occurs in the middle of Japan’s cherry Blossom festival, which runs from mid March through early April as the blooms advance from the south to the north part of the country. In Japan, cherry blossoms are a symbol of spring and signify rebirth. The flowers are often found in Japanese art both for their beauty and symbolism. The blossoms appear in painting, ceramics, screens and kimonos. According to the National Park Service, 12 varieties of cherry trees are now grown around the Tidal Basin. During the peak days for the blooms, the entire Tidal Basin becomes a pink cloud. Crowds line the walkways around the park and cameras capture the color. Just after the peak days, the blossoms fall and create a pink and white snowstorm. The grass and walkways turn into a crimson carpet. In Japan, the trees are widely planted and viewing parties are popular throughout the country. In the United States as in Japan, the Cherry Blossom Festival is a popular time for families to picnic under the trees and admire the panoramic ocean of color. Sightseers sit on benches and blankets enjoying a pleasant afternoon while taking in the scene. Here is a picture of me next to a 17th century Japanese pagoda a gift of friendship from Mayor Ryozo Hiranuma of Yokohama, Japan, in 1958. 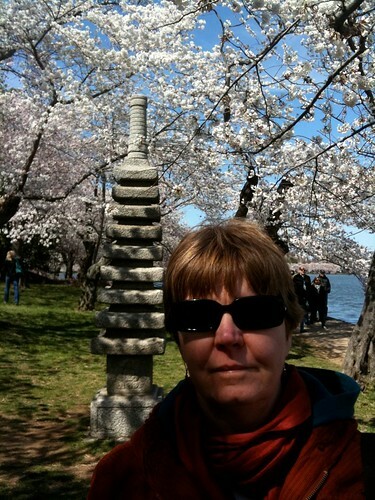 April M. Williams with a 17th Century Japanese Pagoda National Cherry Blossom Festival in Washington D.C. The sun was bright during our visit to the opening day of the Cherry Blossom Festival though the air was cold and windy. The crowds were bundled up in winter coats, gloves and mittens. The weather did not deter the sightseers and pedestrian traffic moved at Sunday stroll pace. Crowds fill the walkways at National Cherry Blossom Festival in Washington D.C. The Tidal Basin and West Potomac Park are favorite gathering spots for locals and visitors alike. 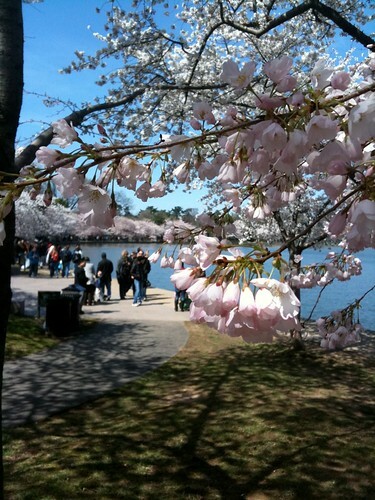 While you view the cherry blossoms, take time to visit the other sites around the Tidal Basin. Keep your ears tuned and your eyes peeled towards the skies. During our visit, we watched Marine One, the helicopter that transports the President of the United States, zoom across the Tidal Basin. Washington Monument seen through National Cherry Blossom Festival in Washington D.C. 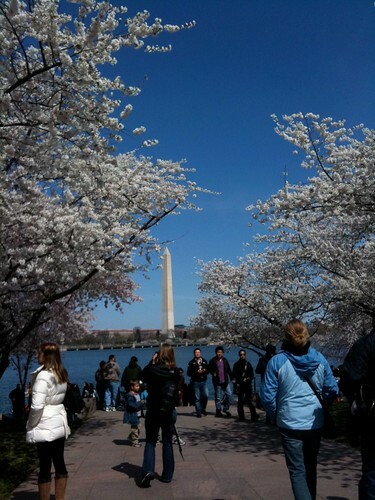 This year, the National Cherry Blossom Festival runs March 26 through April 10 2011. Peak date for the blooms is expected to be April 4. We were looking forward to the Kite Festival originally scheduled for March 28. The event was postponed due to an early spring snowstorm and cold weather. It has been rescheduled for Sunday April 10.